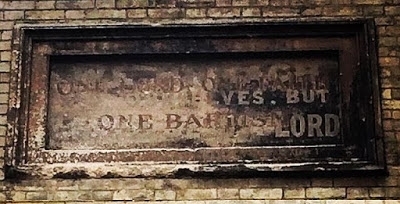 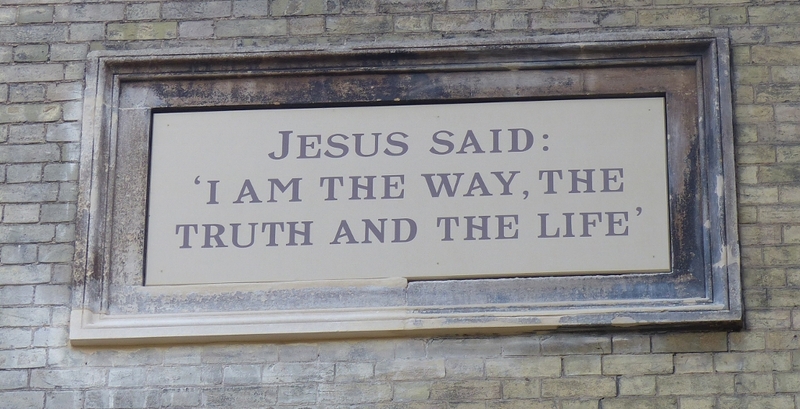 The external restoration work on St James's building, recently completed, included the renewal of the scriptural panels on the West Front of the building. 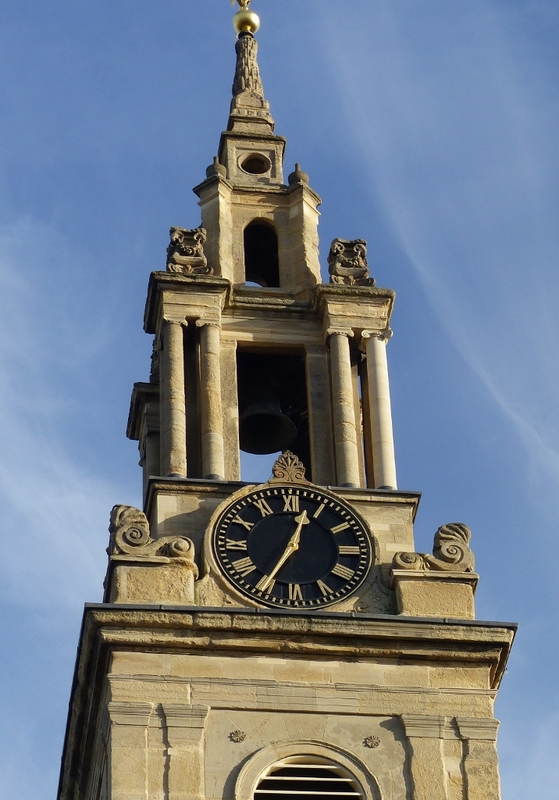 It's been a year of transition and transformation for the church building of St James. 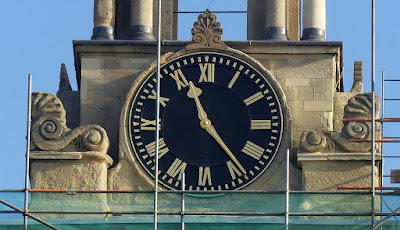 It was good to see the scaffolding down and the work completed in time for Christmas. 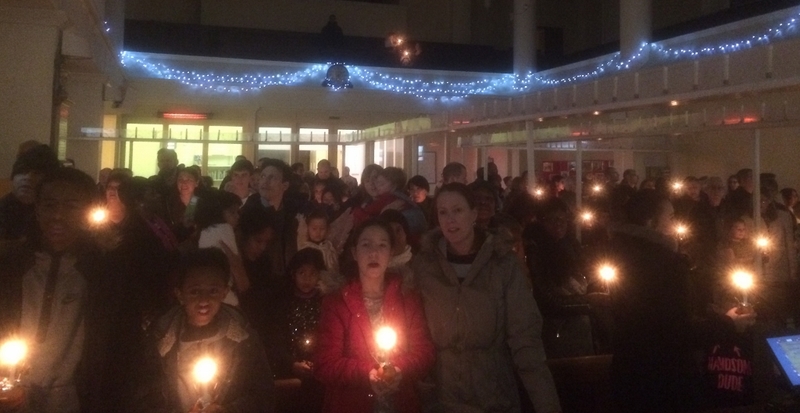 O come all ye faithful: Great turnout, lots of visitors, plus some familiar faces for St James Christmas Eve Christingle service, tonight at 5pm. Pictured below Christingle production line on Sunday morning after the service. St Anne's had its Carols & Christingle service tonight, including a Nativity Play beautifully performed by the children of the Sunday school. Earlier I had spoken about signs, and the message to the shepherds from the angel about the baby lying in a manger which would be a sign to them that the Saviour of the world had been born. 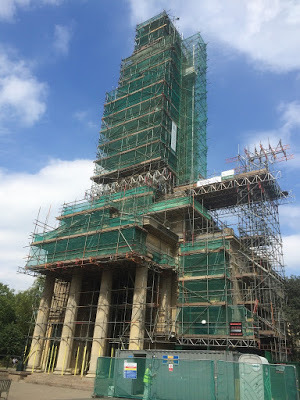 With the scaffolding finally coming down from the bell tower, the second of our two new Scriptural Panels (below) has finally come into view. 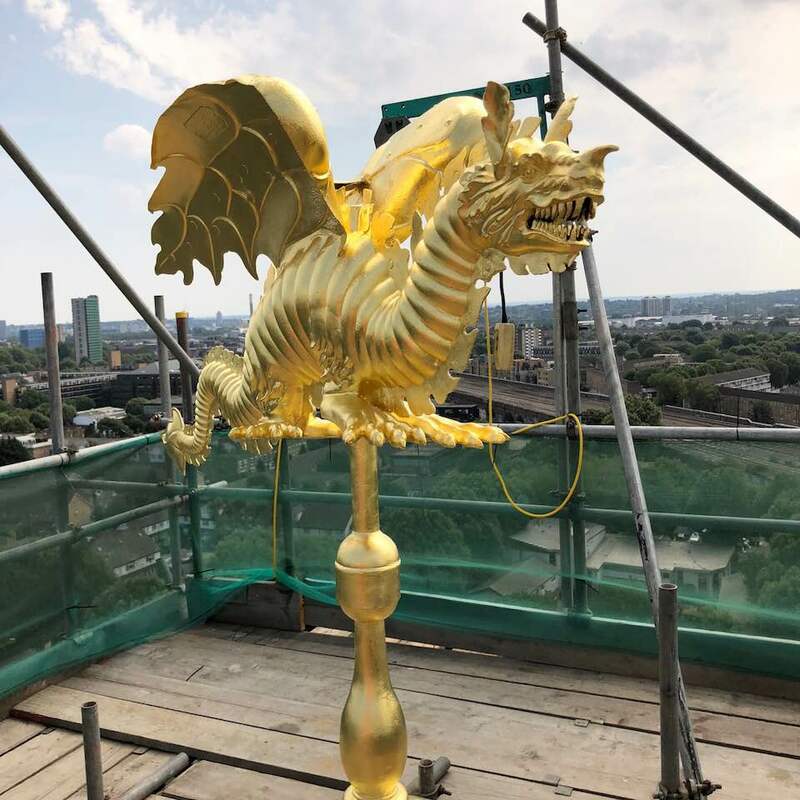 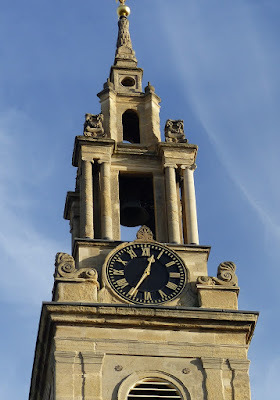 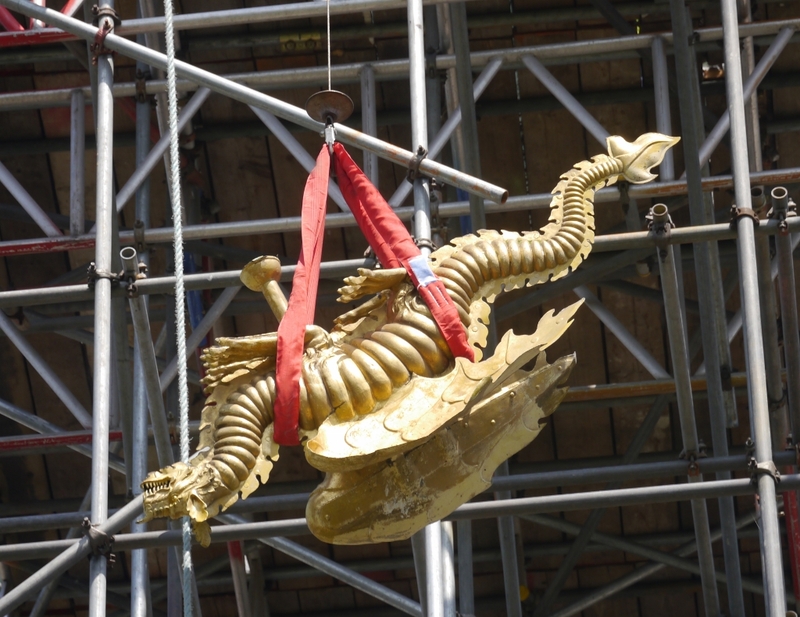 It has been part of a project, now completed, which has seen the masonry of the bell tower repaired, the clock refurbished, and the dragon weathervane repaired and regilded. It is good to have the scaffolding down in time for Christmas and excellent that the external fabric of the church is now in such good condition. On Sunday March 10th we will have a service of thanksgiving in St James for this work of restoration at which the Archdeacon of Southwark, Jane Steen, will be the preacher. In the meantime, thank you to God, and thank you to everyone who has worked so hard to make this project possible: architect, contractors, and PCC building committee, not forgetting our generous funders. 'You'll never guess who I had in the back of my cab today!' 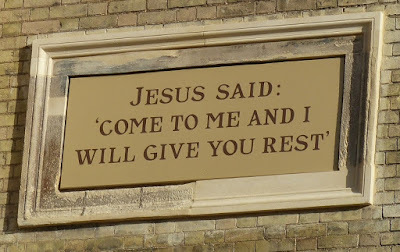 was a favourite saying of my dad (a black cab driver) when he got home at night. The occasion was the visit of Justin Welby to Bermondsey Deanery to make a short video for the Thy Kingdom Come initiative about the parish visiting we did last summer. The visitors were commissioned by the Bishop of Woolwich when he came to launch Thy Kingdom Come at St James on Ascension Day. In our two parishes we visited homes in four different locations spread aover a Saturday morning and three evenings, having previously dropped a letter in saying that we were coming, gave our greetings to the residents and asked them if there was anything we could pray about. 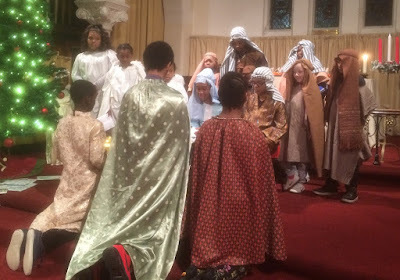 We received a uniformly warm reception from everyone we visited and hope to repeat the project for Thy Kingdom Come next year. It was Sir Simon Hughes, pictured here with the Archbishop this afternoon, who had given the initial impetus to the project, encouraging the churches to emulate the political parties, in getting out there in the parishes, knocking on doors and making contact with people. 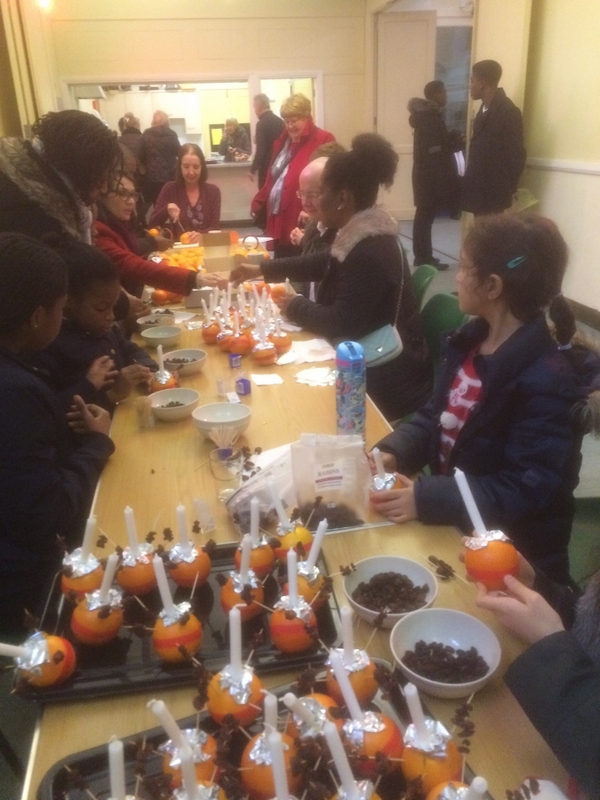 A number of parishes including St Philip's, St James, & St Anne's took up the challenge as part of Thy Kingdom Come 2018. 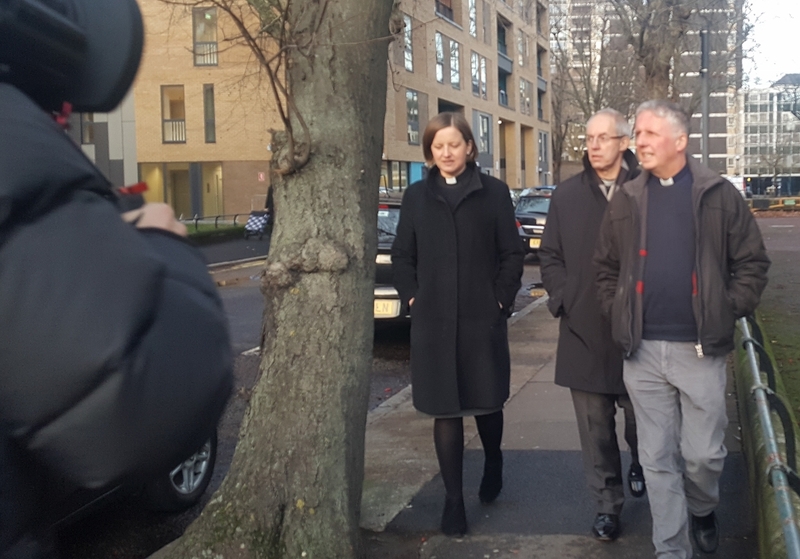 Today the Archbishop met some of the visitors, and spoke to some of us about the project as we strolled around St Philip's parish and along the Old Kent Road to Roberto's cafe. 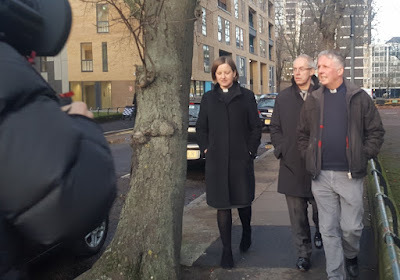 It was good to welcome the Archbishop to Bermondsey deanery. 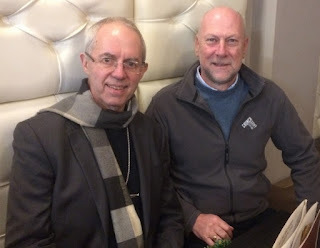 We were impressed by his kindness, warmth and encouragement, and the care he took with individuals, including the young man in the cafe who asked the archbishop if they could have a photo together (they did). Watch this space for the promotional video when it appears. A shepherd (looking suscpiciously like Jacob) dropped into the St James's School End of Term service this morning, hot foot from Bethlehem. 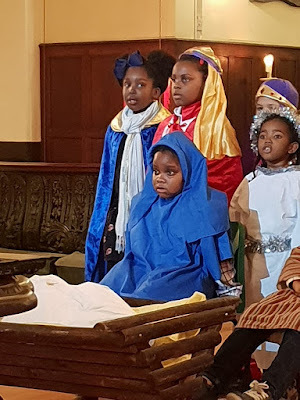 He told us about the angel, the news of great joy of a Saviour being born, how the shepherds rushed into town to see the baby lying in a manger. What a wonderful sight that was - 'better than winning the lottery' said the shepherd. Then, after a quick change, Jacob himself told us about why God has sent a saviour or rescuer. 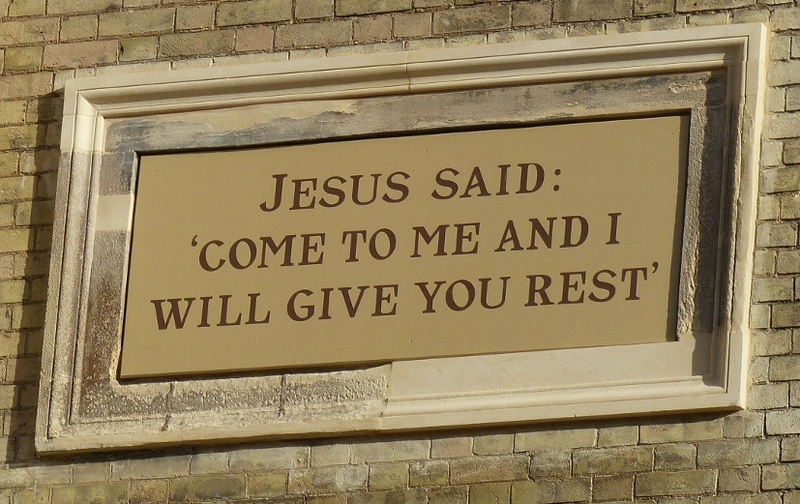 If you are drowning you need someone to rescue you. If your house is on fire you need someone to rescue you. 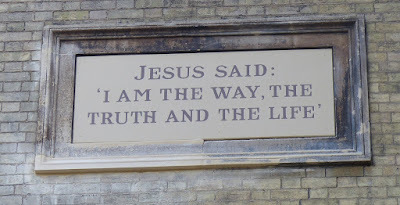 If you are a sinner and you've messed up your life, you need someone to rescue you and that is exactly why Jesus came. 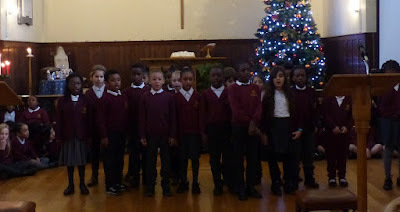 We sung some great carols and left rejoicing for the celebration of Christmas and a good rest for the whole school. 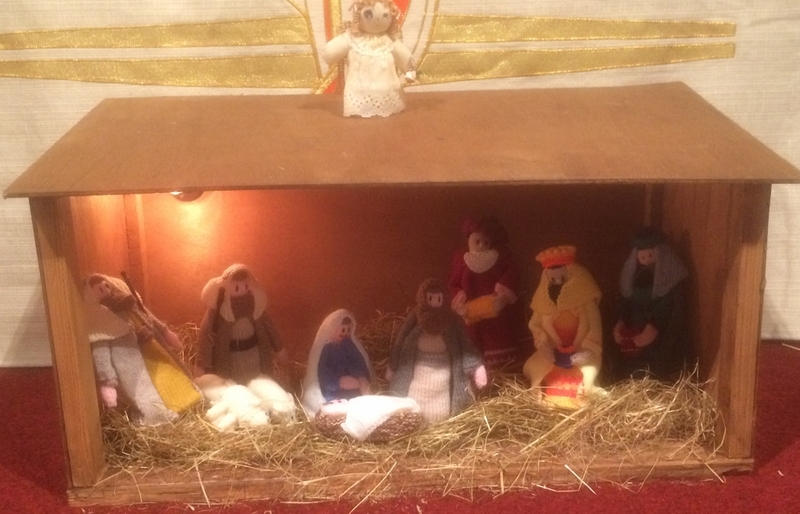 A very happy and blessed Christmas to everyone. Children and parents from St James's School have flocked to the church for the last two days for two wonderful Christmas events. 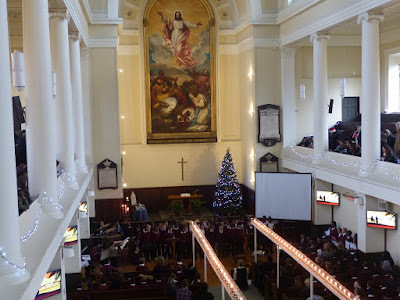 First up, was yesterday's Nativity beautifully performed by the Key Stage One children (above and left), then this afternoon we had a packed church for the Key Stage Two service of Carols by Candlelight (below). 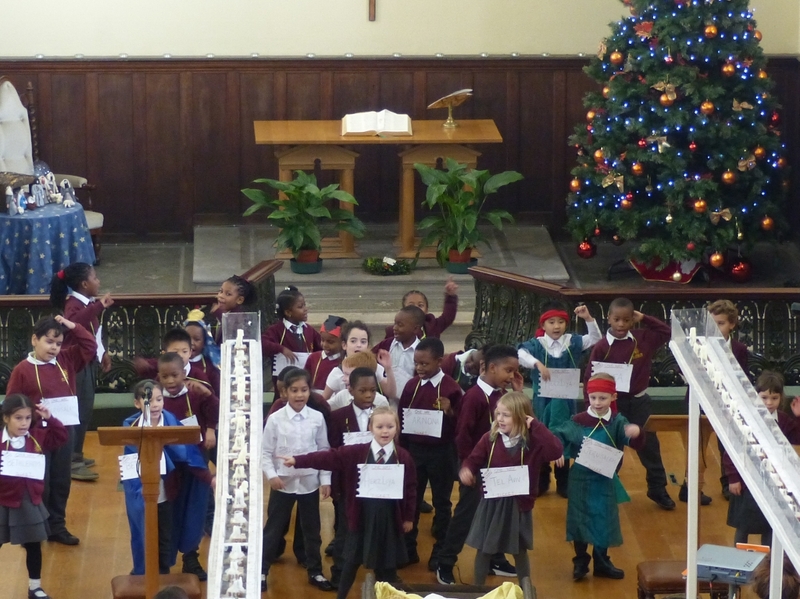 Each year performed a song or medley of songs, the whole congregation sang some well-loved carols, the narrators read beautifully, the children led us in prayer. 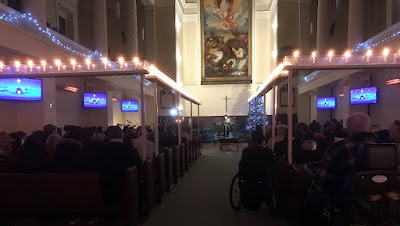 We heard some wonderful instrumental solos from the school's talented musicians and the whole event, masterminded by Miss Jess, concluded with the whole school singing 'O Holy Night' - for me always a highlight of this annual event. A children's nativity, great music from our musicians, the Canon Missioner for the Diocese on the bongos, wonderful singing from a packed church and the Pearly King and Queen in the congregation, all got our Christmas celebrations off to a great start at St James with tonight's service of Carols by Candlelight. 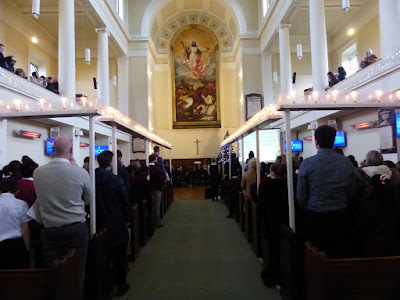 In my sermon I recalled the famous words of the first man to walk on the Moon ('one small step for man, one giant leap for mankind') and then the words of Colonel James Irwin, the eighth man to walk on the Moon, who said 'God walking on the earth was more important than man walking on the Moon. 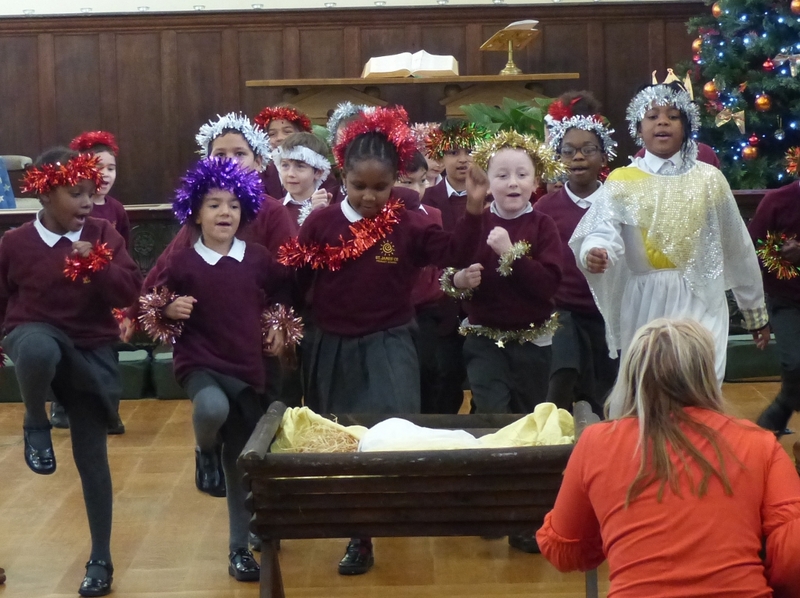 That is something worth celebrating, something to sing about. Great turnout tonight for outdoor carols on the steps of St James, followed by hot minced pies and mulled wine. 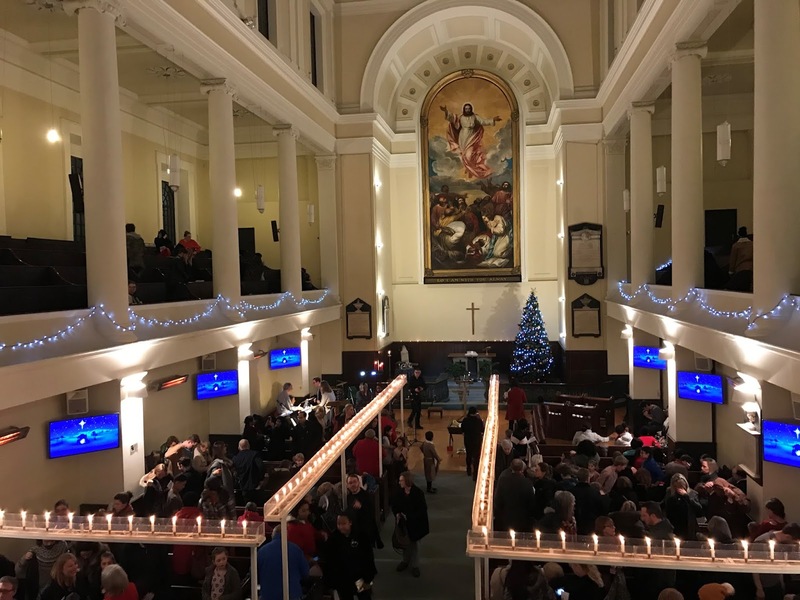 We've just completed delivery of 3,500 Christmas cards (left) , complete with details of all the Christmas services, in St James's parish, with a further 1,750 of the St Anne's version in St Anne's parish. On top of that we gave out fliers to 500 commuters last night at the tube (plus others to shoppers at the Blue last Saturday, and we will give out more at open air carols in the Churchyard. Meanwhile a tweeted photo of last night's carol singing at the tube has been viewed 3,000 times. 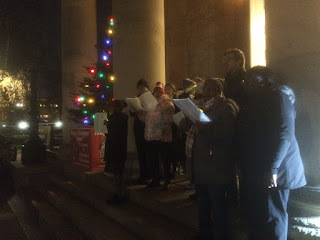 It was good to be singing carols at Bermondsey Tube Station - thanks to TFL and the very helpful staff at Bermondsey. 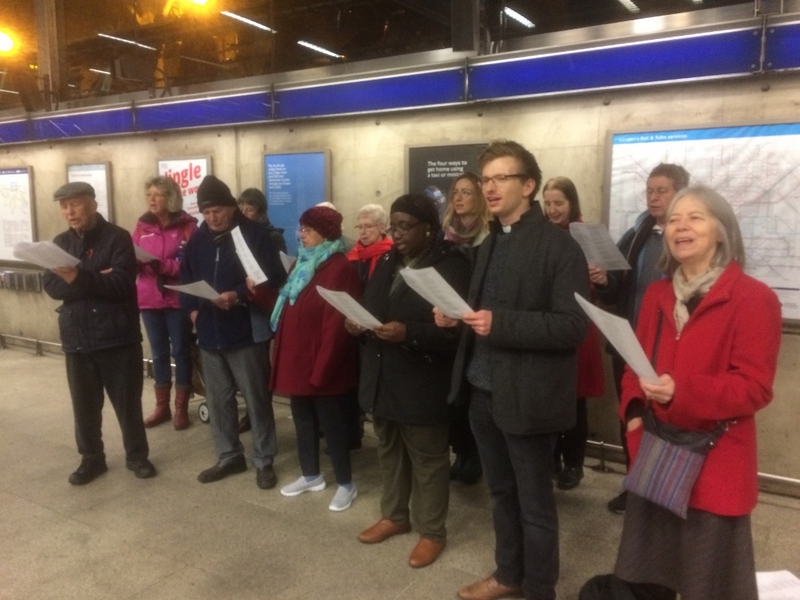 We spread a little bit of Christmas cheer to the commuters on their way home from work, and gave out 500 leaflets inviting folk to our Christmas services over the next two weeks. 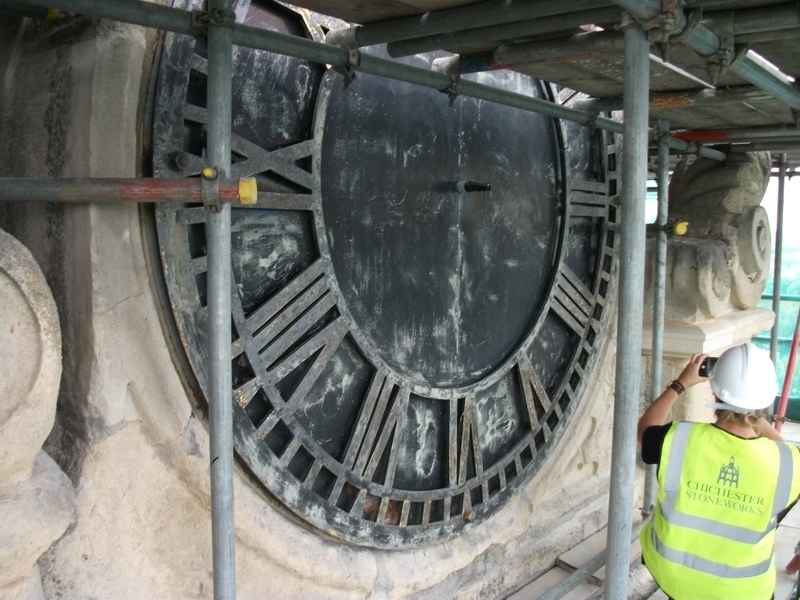 There were lots of appreciative comments and a number of people captured the scene on their phones. 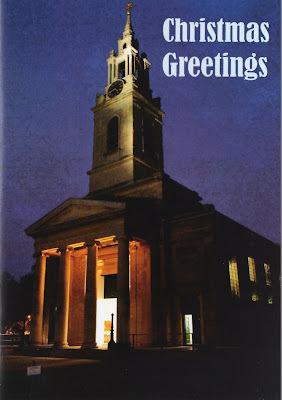 A few people offered us money - this is the bit that always puzzles TFL: that we are not actually collecting anything, just sharing a bit of Christmas joy from the local church to our parishiomers and giving out a few leaflets. 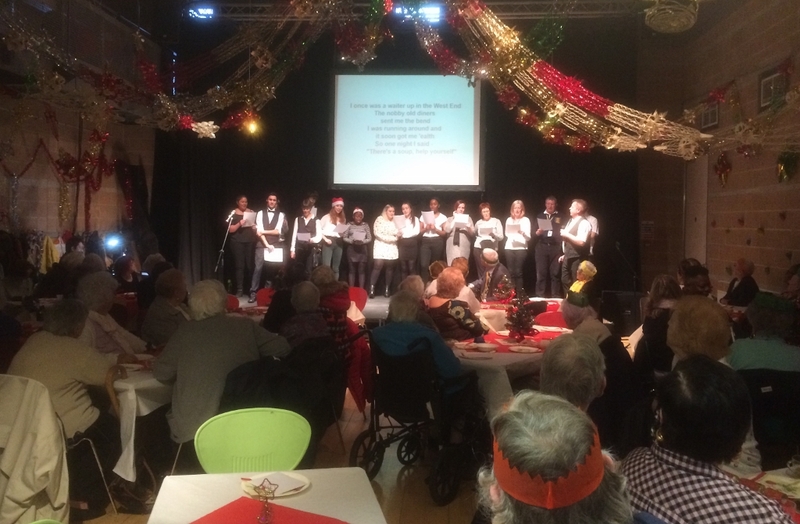 To the Salmon Youth Centre for the annual Old People's Party, a Bermondsey tradition going back many years, featuring a wonderful, a memorable entertainment, a Christmas message from God's word, that old favourite, the Bermondsey Waiters Song ('we like to serve you like you was a star'), presents from Santa, and Christmas cheer all round from Bermondsey's youth centre to some of our district's oldest residents. 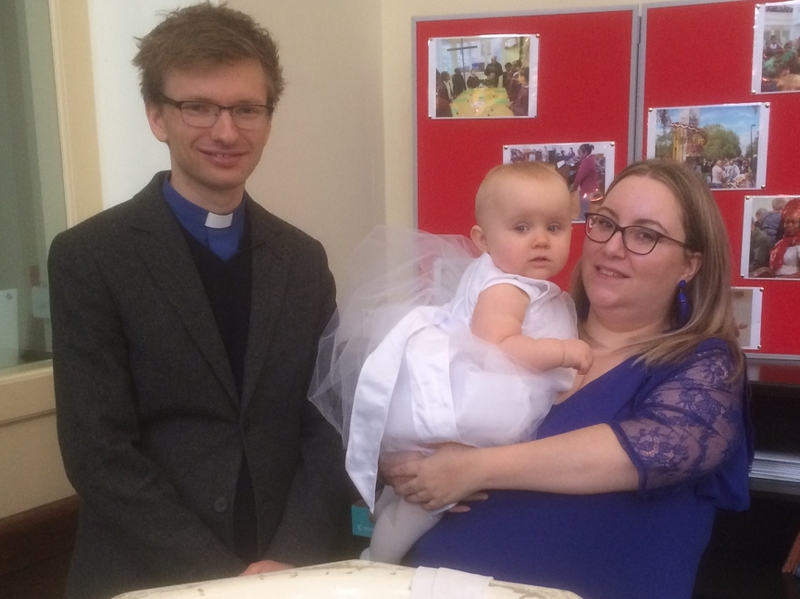 Jacob conducted his first baptism this morning at St James. Baby Sienna, pictured with her mum, is one year old tomorrow, this morning she was baptised and this afternoon she had a combined baptism and birthday party. Congratulations and every blessing to the family. 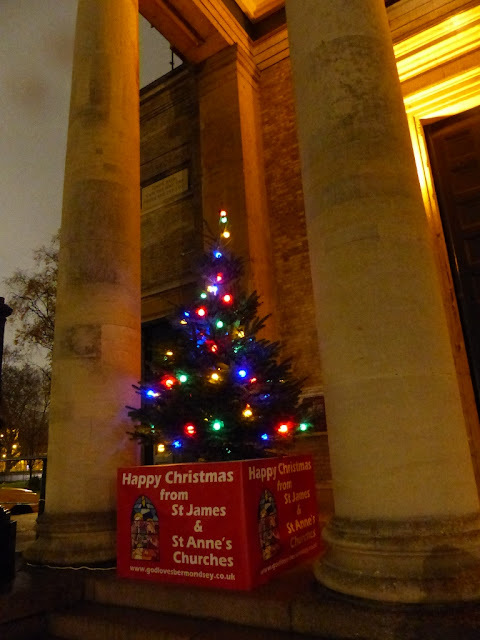 Good to see the Christmas tree outside St James (thanks Paul). 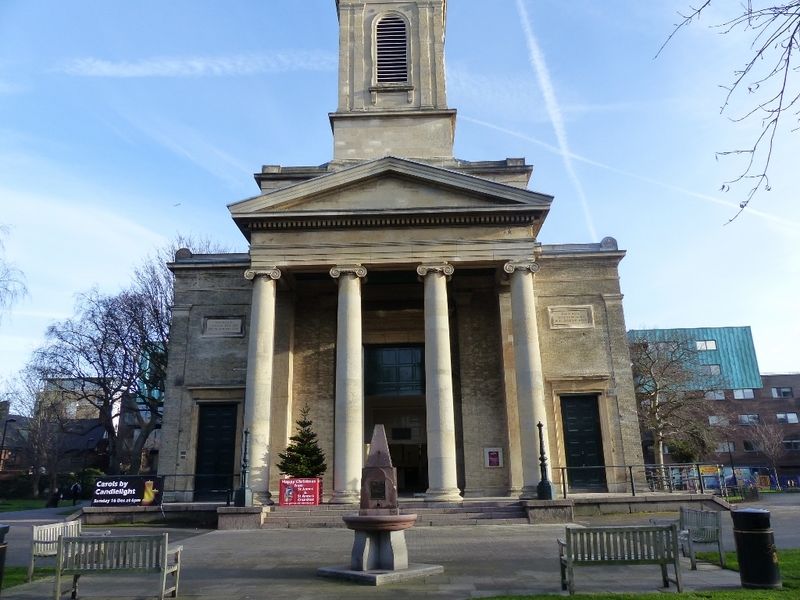 Join us for carols beside it on Wednesday at 6pm, followed by mulled wine and hot mince pies inside the church. 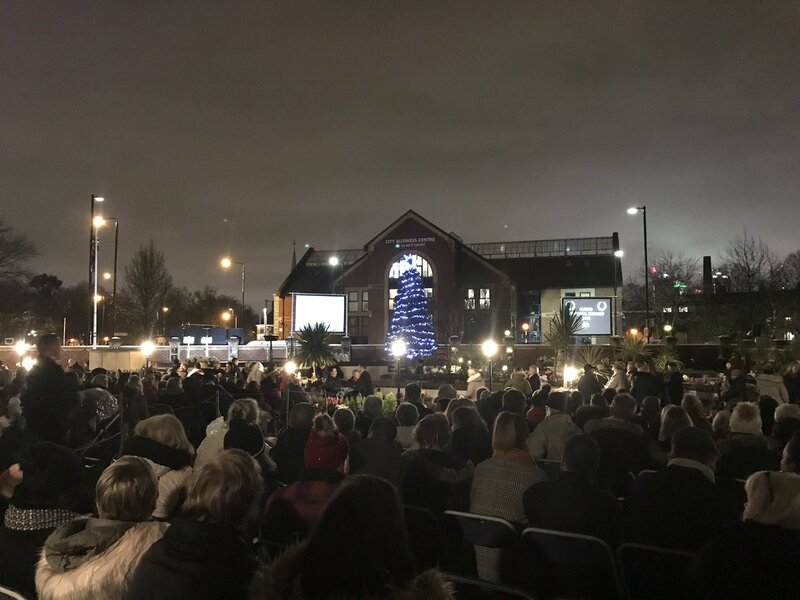 To the Albins Memorial Garden on the edge of Southwark Park for the annual outdoor Christmas Memorial Service, the 19th such event put on by our community-minded local firm of funeral directors, attended by hundreds of local people, the clergy of all denominations, the Mayor, the Leader of the Council, representatives of the opposition party, Sir Simon Hughes and the Pearly King and Queen. 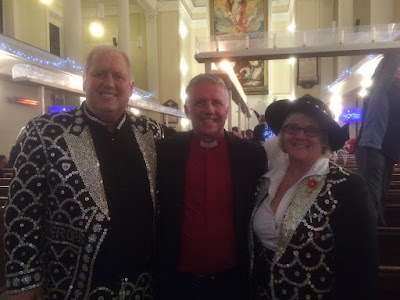 We enjoyed the familiar mixture of prayers by the local clergy, community carol singing, the opportunity to remember loved ones with stars on the Christmas tree, beautiful singing by professional singers, a magnificent firework display to conclude, all followed with traditional Albins generosity by hot soup, mince pies, and bread pudding for the thousand or so people who attend this unique community event. A big thank you to Jon, Simon and the whole Albins team for a meticulously planned and executed event, which brings comfort and hope to troubled hearts at Christmas time, when the loss of loved ones is often felt most acutely. 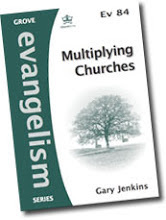 Let Me Tell You About My Church from Transforming Teesside Together on Vimeo. This year's outdoor carol singing by the Christmas true at the Blue went ahead as planned and it even stopped raining. 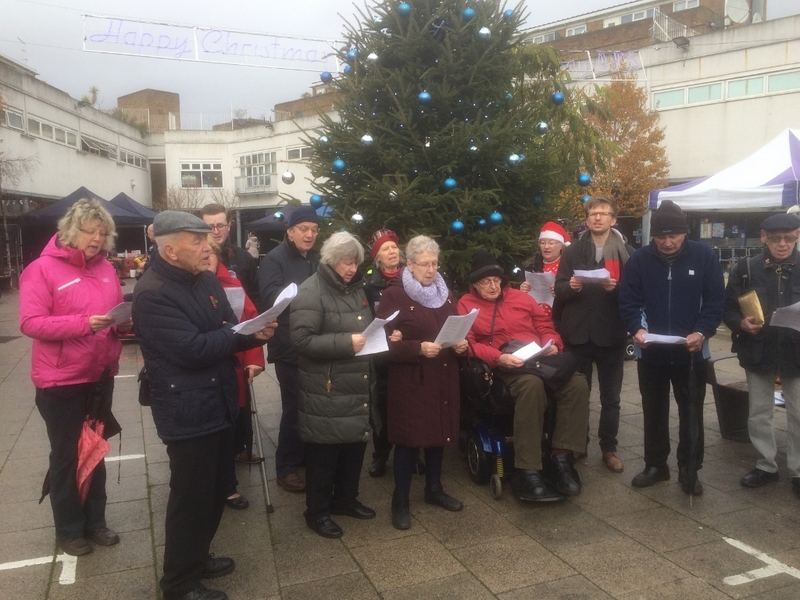 Lots of leaflets were given out inviting people to our Christmas services, and there was huge appreciation from passersby at our attenpt to spread some Christmas cheer in the heart of Bermondsey. 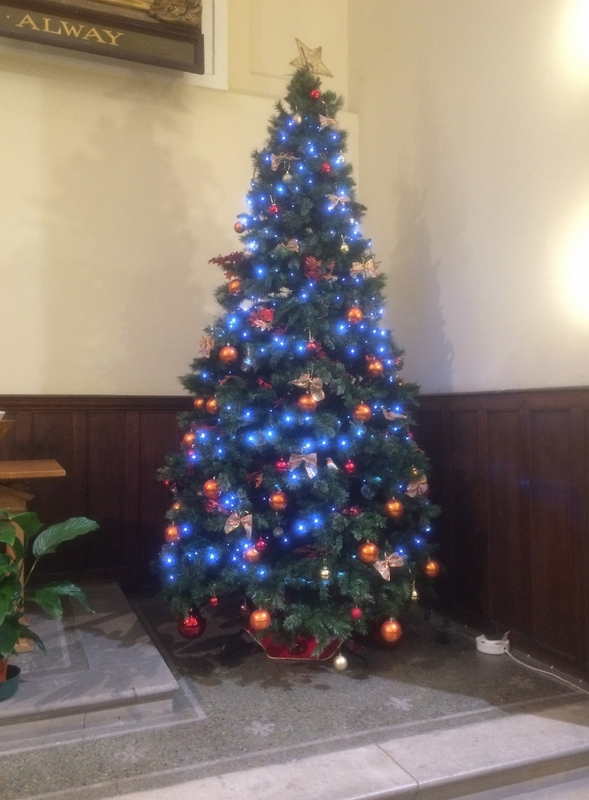 So, thank you to everyone who came and to everyone who stopped by for a chat. 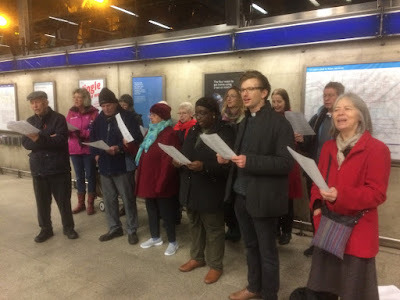 Next up: Monday 10th December, carol singing at Bermondey Tube (6pm); Wednesday 12th December, carol singing outside St James. We first got to know Ivan (left in the picture) when he came to us at St James for a placement as part of his training to be a Reader in the Church of England. 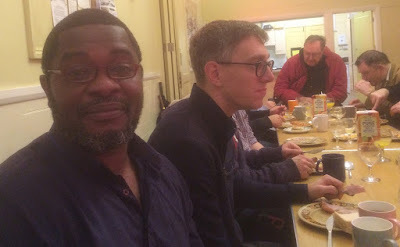 Ivan is a member of our near neighbours, Holy Trinity, Rotherhithe, and today he was back at St James to talk to our men's breakfast. 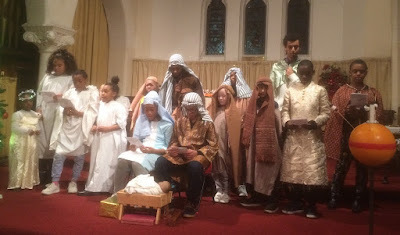 Ivan is married with four children. 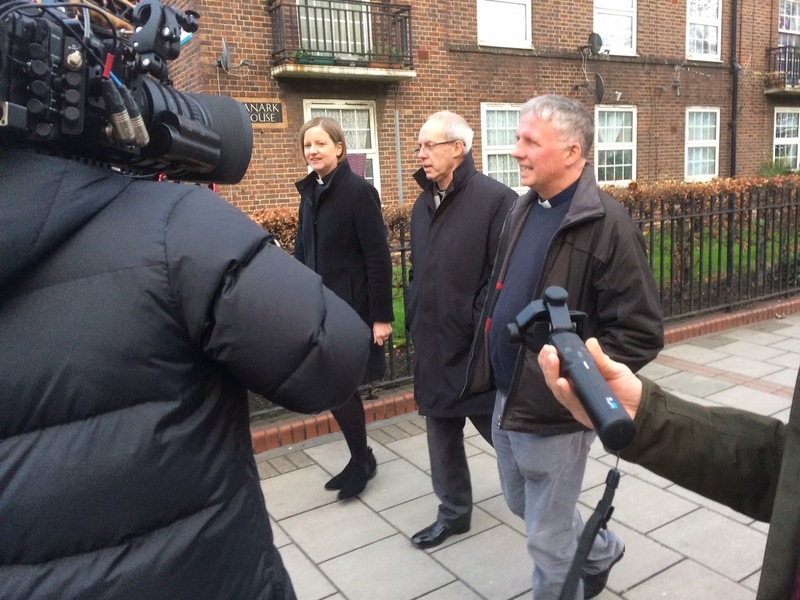 Today he told us the story of how his eldest son as a small child was diagnosed with a serious illness which has left him with serious and lifelong disabilities. 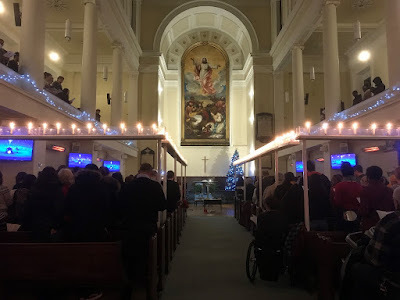 He spoke with great honesty and candour about all they have been through as a family, and how their faith in Christ has sustained them in some very hard times. 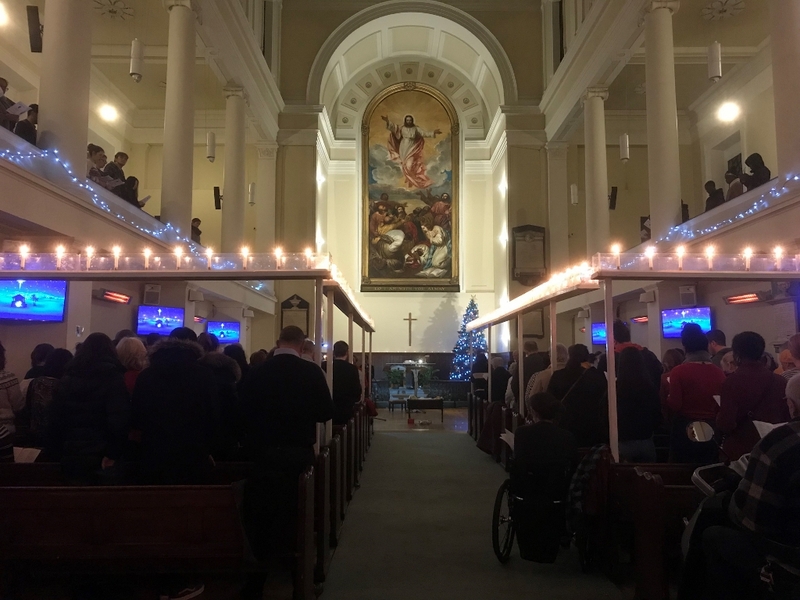 It was a powerful and moving talk, interspersed with references to Scripture and prayer that have strengthened and guided him in his life as a Christian, and, now as a Reader at Holy Trinity, and as a voluntary chaplain at Guy's Hospital. Thank you, Ivan, for coming to share so much of yourself.